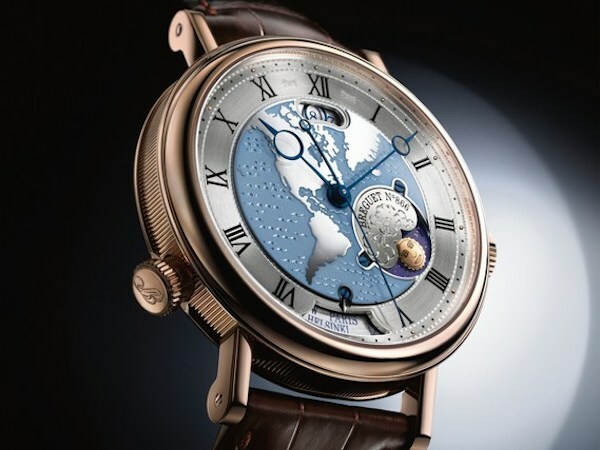 Home » Watches » What is the Breguet Classique Hora Mundi Watch? What is the Breguet Classique Hora Mundi Watch? Hora Mundi, which is Latin for world time, is an exquisite traveler’s timepiece crafted by Breguet–one of the world’s most illustrious watchmaking brands. Join us as we find out what is the Breguet Classique Hora Mundi watch and take a closer look at a particularly precious version in platinum. Breguet unveiled the Hora Mundi watch in 2011, boasting an innovative instant time-zone jump display with synchronized date, AM/PM indicator, and city display–a world first for a mechanical watch. 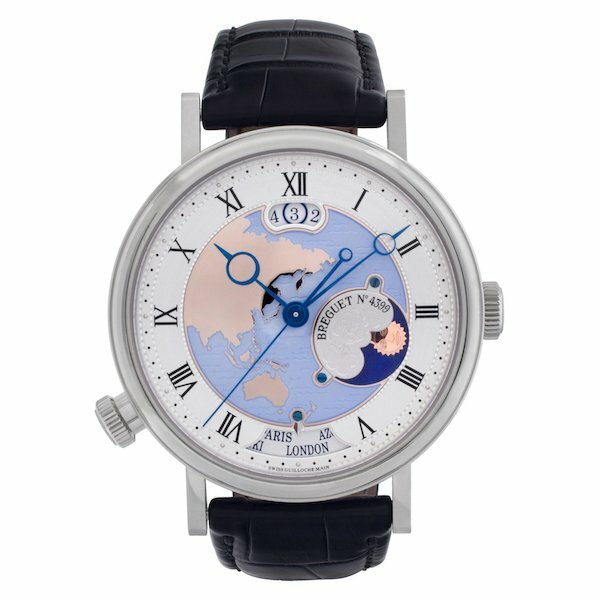 Although it is named after the Latin words for world time, the Hora Mundi is not a world timer watch but rather it is a highly complex GMT watch. Powered by the automatic Breguet Caliber 77F0, the Hora Mundi lets wearers select and set two cities (one for local time and one for home time) from the 24-city disk representing the world’s 24 time zones. Pre-selecting the cities and setting the correct time, date, and day/night display is done via both the winding crown/pusher at 8 o’clock and the winding crown at 3 o’clock. Once set, the wearer simply has to trigger the pusher at 8 o’clock and the watch will automatically flip through the pre-determined cities, correctly adjusting the time, date, and day/night indicator as necessary. Although the caliber inside the case is mechanically complex with 362 components, 43 jewels, a silicon Breguet balance-wheel, and a silicon Swiss straight-line lever, the Hora Mundi watch is delightfully easy to use and includes a 55-hour power reserve. When Breguet launched the Hora Mundi 5717, the brand made two material versions–one in rose gold and one in platinum. The Breguet Classique Hora Mundi ref, 5717PT/AS/9ZU features a 43 mm platinum case with the familiar Breguet-style fluting on the caseband. Housed in the case is a gold dial, hand-engraved on a rose engine. 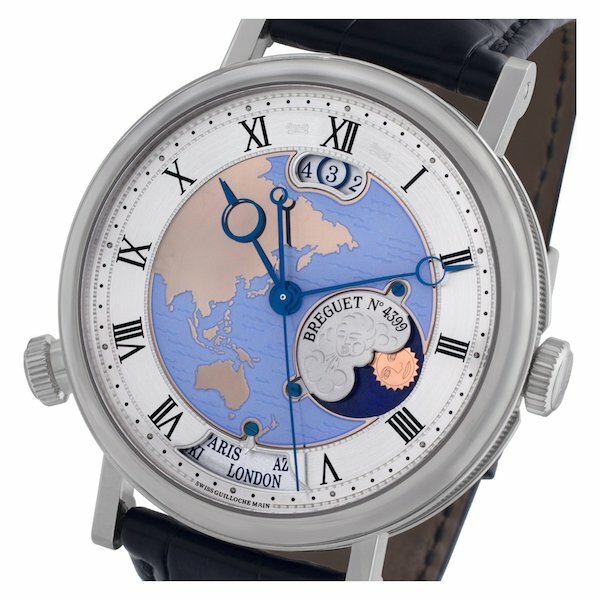 On this particular model, the center of the dial displays Asia and Oceania and Breguet also offers American and Europe-Africa versions. Encircling the center map is a chapter ring with Roman numerals, while the date window, day/night indicator, and city aperture are positioned at 12, 3, and 6 o’clock, respectively. Note the winding crowns at 8 o’clock and 3 o’clock used together to operate the mechanical watch. The back of the watch includes a sapphire exhibition caseback offering a view of the Breguet Caliber 77F0. Aside from its impressive functionality, in true Breguet fashion, the automatic movement is superbly decorated from the guilloché winding rotor in gold to the prestigious Côtes de Genève stripes. The platinum Breguet Classique Hora Mundi watch is fitted with a classic black leather strap with a platinum deployant clasp. With its innovative mechanical movement, platinum construction, and intricately decorated dial, the Breguet Classique Hora Mundi 5717PT is an extraordinary example of haute horology. 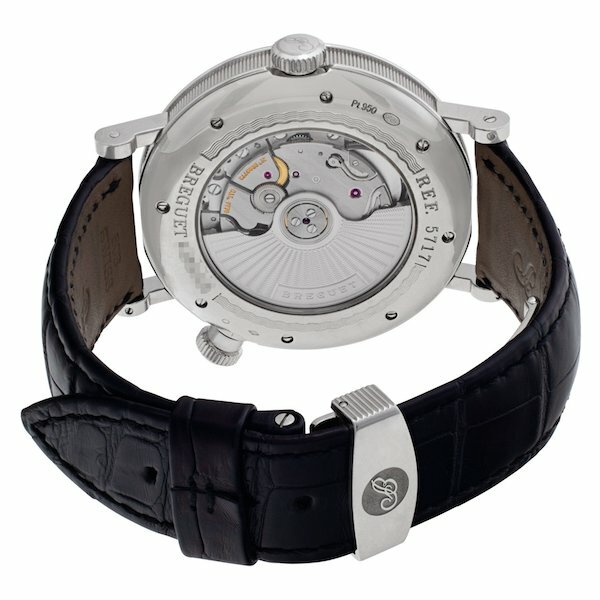 Reserved for the most discerning of timepiece enthusiasts, the Hora Mundi is a very special high-end watch that is an absolute treat to own and wear.